When it comes to sports fandom, there are two very different worlds that rarely overlap: there’s the one where the Super Bowl and the World Cup and other “real” sports take place and draw fanatical interest — and then there’s the one where the sport in question is League of Legends or Counter-Strike, and fans watch their heroes play in real-time on the streaming service Twitch (now owned by Amazon). Members of the former have plenty of apps from ESPN and the like for them to use when catching up on their mobile device, and now residents of the latter have their own app as well, courtesy of a Canadian upstart called theScore. 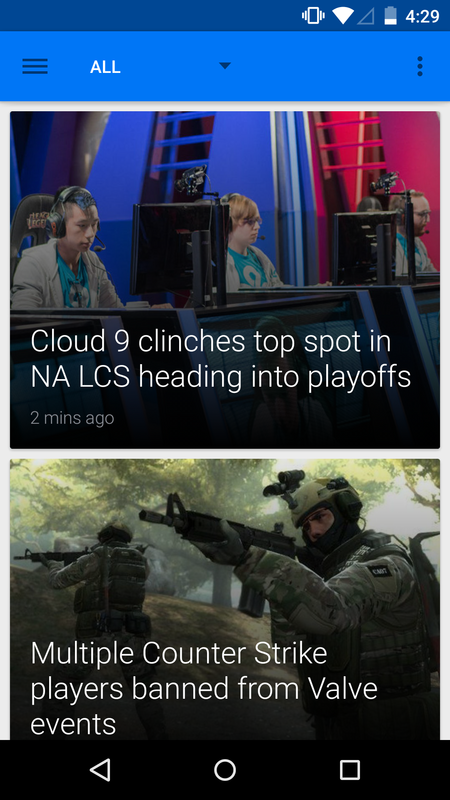 The app, which is just called eSports, launched on Wednesday for Android (an iOS version is coming soon, the company says) and offers more or less the same kind of mobile, real-time news coverage of the e-sports world that regular sports fans get from ESPN and other apps. TheScore has a team of about 15 writers and editors who are responsible for producing content, mostly based in Toronto. It may once have been a sort of underground phenomenon, but now players of e-sports can make millions in endorsements, and e-sport matches have sold out venues like the Staples Center in Los Angeles. According to one analytics firm, about 71 million people watched 2.4 billion hours of e-sports in 2013, up from 1.3 billion a year earlier, and by 2018 that figure is expected to hit 6.6 billion. Some players have actually given up tournaments and now get paid just to play online. Sports have been in the Levy family for three generations now: Benjamin’s grandfather started a cable company in Ontario in the 1950s and was one of the first to launch a sports ticker on television called Sportscope. Over the years, that became a channel called Headline Sports, which in turn became theScore. The family sold the TV assets of the company to Rogers Communications in 2012, but spun out the digital assets as a separate company called Score Media, which is publicly traded. The YouTube ID of ADYenPE27Wk?rel=0 is invalid. Levy says that it became obvious even a few years ago that theScore would only ever be a Canadian television story — but the potential for the web and digital was much larger. So the company focused on the web and on its apps, and the COO says it now has more than 10 million monthly active users, with more than 60 percent of them coming from the U.S. and about 15 percent from the rest of the world other than Canada. Here I thought I should mention http://www.simicart.com. SimiCart is an Magento mobile app builder, which will automatically build a naitive Magento mobile app for your online business within the information you provide. Within 3 mins, not 30 days or 3 months as normal, you can have powerful mobile shopping apps with optimized mobile UI. SimiCart is an Magento mobile app builder, which will automatically build a naitive Magento mobile app for your online business within the information you provide. Within 3 mins, not 30 days or 3 months as normal, you can have powerful mobile shopping apps with optimized mobile UI. Is this app available for desktop browsers, or just mobile device users? I’ve been actively watching Twitch TV for 2-3 years now. The quality of content production is somewhere between radio and reality television for the popular channels. The top channels and main events have prime time TV level production. The cool part about it is that it’s always LIVE. You have people streaming from every continent so something is always prime time and live. That’s the key. Television has too much down time. The economics are getting very big very fast. Just look at video game revenue as opposed to the entire movie industry.